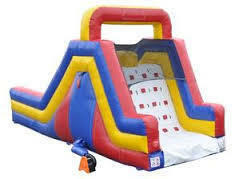 Rock Climbing Slide!!! A great combination for all ages, this game is sure to bring out the kid in all of us! Two contestants begin to tackle a 14-foot rock climb wall. Using a climbing rope, each contestant pulls themselves up the ‘rocks’ and reaches the top to experience a fast and fun slide to the finish.